you are here : home > service & business > May Curtain & Décor Co., Ltd.
May Curtain & Décor Co., Ltd.
overview of May Curtain & Décor Co., Ltd.
May Curtain & Décor Co., Ltd. was in 1998 by the famous brand I.S. Curtain Co., Ltd. in Chiang Mai. May curtain & Décor Co., Ltd. in Phuket was created by 3 professional partners from different interior decorating fields; one partner from the original I.S. Curtain Chiang Mai, another partner from interior design background and another partner from a large fabric factory, all providing different fields of expertise for the company. May Curtain & Décor Co., Ltd. has a strong client philosophy and unwavering dedication to open communication, reliable delivery service and to build a collaborative design partnership with all of its clients. 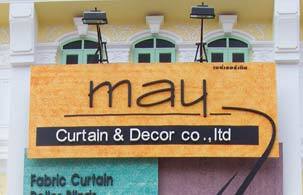 May Curtain & Décor is headed by Khun Nattha Saengvithu, as the Managing Director. Khun Nattha is personally involved with every phase of the design process for all of your curtain needs; from needs assessment through the installation. With allows her to be fully responsible for every aspect of each project. Other partners act primary as supporting productive teams fuelling each project with all that is required to achieve excellence in quality, deliverables and overall success of the project. May Curtain & Décor has been sources for all elements required by each project. This structured resource network allows the company to perform on a professional level integrating with Phuket’s finest hotel and villa projects serving mainly a very demanding international market. Interior integration is executed by a strong qualified team of manual workers with diverse skill-sets. May Curtain & Décor also provides its own in-house interior designer to properly assist each client with design, consultation and recommendations that will surpass your expectations. From interior designs, component sourcing, project coordinating to complete implementation, May Curtains & Décor is determine to successfully hand over high quality work with constant attention to details and clients requirements. photo gallery of May Curtain & Décor Co., Ltd.
map & location of May Curtain & Décor Co., Ltd.